Too often in life we subscribe to Will Ferrel’s lovable character’s motto from the movie Talledega Nights and we focus solely on the “winner” or “champion” and forget about the rest of the competitors. Look at the great Laurent Fignon, who just passed away. He will be remembered more for the one memorable race he lost instead of the many he won. And it’s not just on the professional level. Just last year I came home from a race after turning myself inside and out to come in second place. I get out of my car and my neighbor, who has no idea what a tubular tire is, asked me how the race went. I proudly told him I crossed the finish line a few seconds behind the winner to claim the second spot on the podium and his response was, “Great, first loser”. If you race cross long enough and move through the various categories you will find yourself at some point in many different positions in the race. One year you might be fighting it out each week for a podium spot and the next just trying not to come in last. I am currently facing the latter. Last year, I was getting front row call-ups, winning holeshots and picking my own lines. Now, I am five rows back and “rubbin’ paint” as we fight to get past the prologue! (my second NASCAR reference. What do you expect from a Mississippi boy?) But as we all know, unless you are lucky enough to be leading a race, it doesn’t really matter where you are because one thing is always certain in cross: there is always someone in front of you to catch and pass. This is where most of us spend 100 percent of our race. 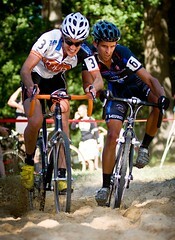 Schempf battling in the sand at Charm City. The purpose of this article is to look into the minds of a couple of the prominent racers across the Mid Atlantic and get a sense of what they are feeling during the “chase.” Do these guys hurt like we do out there? Do they have negative thoughts and consider packing it in? I think you will enjoy their insights and may even learn something from their experiences. Wes Schempf, a fellow C3-Athletes Serving Athletes teammate, is considered one of the best in the area. He is a former overall MABRAcross and MAC Elite title winner. Wes has had a few memorable experiences racing against pro mountain biker Jeremiah Bishop. Wes explains what it is like for him to fight it out with the former U.S. Champion in MTB short track and marathon in a cyclocross race.